As an important member of the food service team, the Nutrition Care Specialist prepares all types of food according to Army standards and dietary requirements. They work closely with Registered Dietitians in hospital, clinic or field situations, planning special diets for patients based on specific soldiers' individual needs. This job is Army military occupational specialty (MOS) 68M. If you have a background in cooking or culinary training, or just an interest in this area, the Nutrition Care Specialist could be a good fit for you, especially if you're interested in a post-Army career helping patients and others with complicated dietary needs. 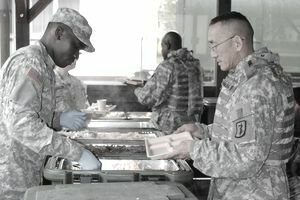 These soldiers are responsible for ordering and inspecting food supplies and preparing meals for fellow soldiers. The Nutrition Care Specialist is primarily responsible for assisting in the supervision of medical nutrition care operations. This involves providing dietary treatment and counseling for patients in nutrition clinics, wellness programs and others with nutritional restrictions or needs. These soldiers assist the dietitians with food prep, menu planning, and production, make food recommendations, and screen patients for nutritional restrictions. Soldiers in MOS 68M will prep and cook modified and standard food items according to these nutrition care treatment plans, all under the supervision of a dietitian or non-commissioned officer. Job training for Nutrition Care Specialists currently requires ten weeks of Basic Combat Training and seven weeks of Advanced Individual Training that will include small quantity food preparation. Some of the skills you’ll learn include individual and classroom presentations, how to assess a patient’s dietary requirements and restrictions, menu planning to include recipe modification for special diets, and basic food preparation in large and small quantities. You'll also be trained in food safety and sanitation methods. You'll need a score of 95 in the operators and food (OF) segment of the Armed Services Vocational Aptitude Battery (ASVAB) test. There is no security clearance required for this particular Army job, but you'll need normal color vision, meaning no colorblindness. While food service is the primary function of MOS 68M, it's not all about cooking and prep. Having an interest in nutrition, health, fitness, biology, and chemistry will help you be successful in this role. You should have an interest in an affinity for caring for others (also known as good "bedside manner"), and it's important you're able to communicate clearly and effectively to both individuals and small groups. Since you're not a medical professional, you won't be diagnosing patients, but you'll be an important part of their treatment and ongoing care as a MOS 68M. This is an Army job ripe with numerous post-military career opportunities. You can get work as a line cook or sous chef in a restaurant or other organization, and are qualified to pursue a job a dietetic technician. MOS 68M also prepares you for jobs in supervisory positions over food prep and servers. While it’s true that you’re less likely to be on the front lines of a battle situation, and you’re probably not going to be handling classified information, don’t think of this job as lesser to the Army's overall mission. Well-fed, healthy soldiers are absolutely necessary if any of the Army’s objectives are going to succeed.